The Thomas’ aren’t from Chesterfield County!?! My maternal grandmother, Florrie Thomas Martin, supplied me with the names of her parents, grandparents, and great-grandparents. She even knew their birth and death dates. She was a wealth of information. I knew Florrie was born in Chesterfield County, South Carolina, and that her mother, Maggie Grant Thomas, was from there. Florrie’s Aunt Sally (sister of Florrie’s father) and her family lived there, too. Naturally, I concluded that Florrie’s father, Dan Thomas, was from there as well. Also, I knew that in their later years, Dan and Maggie lived in Chesterfield County which added to my belief they were all from Chesterfield County. For many years I concentrated on my own father’s family history since I lived close to where his people were from, so research was easier. This was before computers. Still, when I did census research at the National Archives for my dad’s family, I pulled the census records for my Thomas people in South Carolina. I wondered why some of them were in Richland County, South Carolina, but put those questions aside as I worked on my dad’s family. Many years later, I finally began working on my maternal line. My grandmother had passed, and her parents had passed long before I was ever born. But my mother’s first cousin, Agnes, knew a lot about the Thomas family. 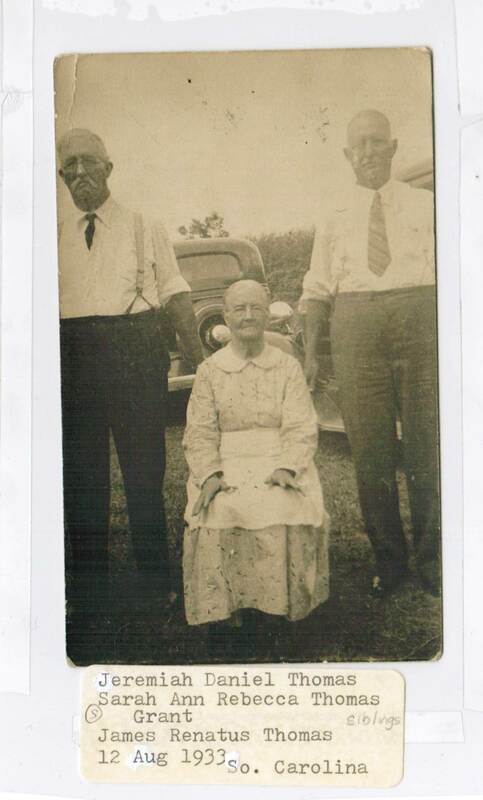 She had been raised in South Carolina, and she knew my great-grandparents, Dan and Maggie Thomas, and she knew Aunt Sallie and her children, too. My mom’s family had left South Carolina when my mom was about four, so she’d had limited contact with them all. Turns out that Sallie married a man from Chesterfield County, Henry Grant, and moved there with him. (I have yet to discover how she met Henry to start with.) Henry died unexpectedly, and Dan left Richland County for Chesterfield County to help Sallie take care of her farm and her five young children. Maggie Grant, Henry’s sister, caught the attention of Dan. They married less than a year later and started a family. 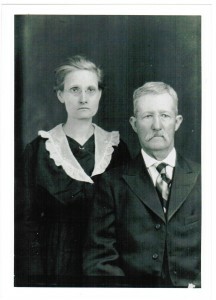 Dan continued to farm Sallie’s land, and he was like a father to her children. After living in Chesterfield County for many years, Dan and his family, including all their children except for their oldest son, moved to Richland County because Dan’s parents were aging and he was needed there. When Dan and Maggie themselves got older, they moved back to Chesterfield County. One of Sallie’s sons, Jim T. Grant, built a little house for Dan and Maggie on his property. You can read about Jim T. and the house here. Suddenly so much fell into place, like why I couldn’t find more Thomas’ in Chesterfield County or much of anything on these people except for some census records. The world of the Thomas’ opened up with this new found information. And I’ve been learning about the Thomas’ ever since. I solved this problem by asking questions and taking notes. Whenever I speak to relatives, I have pen and paper nearby. You never know what tidbit will be said that becomes important later. How lucky you were to have your grandmother, Florrie, to provide so many family details, even if she didn’t include the fact that the Thomas family wasn’t from Chesterfield County. You are also lucky to be living near where some of your ancestors lived. Thank you for sharing. Linda, I didn’t realize until later how fortunate I was to have Grandma in my life. She lived with our family, so my sister and I knew many of the extended family who came to visit her. Extended family was always a part of my life. I guess I was destined for genealogy research from the beginning. Thanks for commenting. Great pictures. I’ve done that where I’ve automatically assumed everyone from a certain family line must have come from that area. I think it is a human nature thing, just because it makes things all neat and tidy in our minds. Glad you were able to discover the truth. And I’ve come to find that our ancestors lives were rarely neat and tidy. Seems like a lot of them had a lot of drama going on in their lives, just like people. Thanks for commenting, Andrea. I love the fact that there is reference made here to what is in living memory. And that the author was prepared to make a U-turn in her research to get back on the right road.